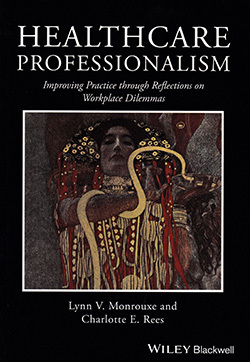 Head of research and publications for Dementia UK Karen Harrison Dening reviews Healthcare Professionalism: Improving Practice through Reflections on Workplace Dilemmas. This book may appear to be a ‘stiff read’, given its topic and the density of the text. However, I was pleasantly surprised and waded through it with ease. The main positive point is its excellent layout and presentation, especially the way the text is broken up into boxes to highlight common themes throughout each chapter, such as learning outcomes for reflective sessions and case study narratives. Each chapter is also rounded off with a summary, discussion points, learning activities and recommended reading, which helps the reader to draw conclusions at each stage to consolidate learning. The book’s focus is the healthcare student and undergraduate reader. It is not limited to nursing, but is also aimed at students of medicine, dentistry and pharmacy. While nursing students may feel there is little that is specific to their discipline, there is much learning to be gained from the insightful reflections of a wider, multidisciplinary body of students. The book would probably be of value when considering assignments and studies related to professional behaviours and attitudes, but at £34.99 a copy, it is more likely to be better placed as a library resource.